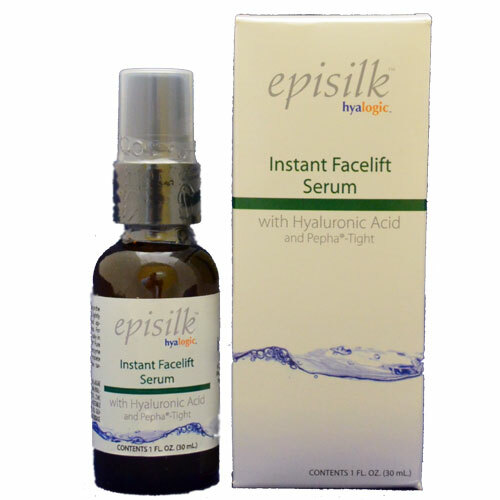 Episilk™ IFL Serum is an effective combination of hyaluronic acid and Pepha-Tight® designed to hydrate and support the natural firmness and elasticity of the skin. Soothe, nourish and rejuvenate your skin while reducing the appearance of wrinkles. Pepha-Tight® is a unique ingredient with the ability to support the skin’s natural firmness and vitality. It is derived from a microalgae and designed to firm and tighten skin while at the same time promoting a healthy collagen network. hyaluronic acid(HA) is an important element of skin known for its ability to bind up to 1000 times its weight in water. The body’s HA production naturally decreases with age, leaving the skin dry and wrinkled. Replenishing the body’s natural HA allows skin to retain moisture and provides volume, form and lift. Apply twice a day to wet skin or put a small amount on the back or side of your hand, and mix with an equal amount of water. These serums are very concentrated and adding a very small amount of water will help activate them for best results. Apply to the areas you desire to see results according to the serum you choose! To avoid contamination of product, use caution when removing the dropper from the bottle avoiding any surface or object other than the fingertip and the inside of the bottle. The efficacy of Pepha-Tight® was performed in an in vivo study with 30 volunteers during 2 weeks. The figure shows the statements of the panelists reporting a very good/good tightening effect. The immediate efficacy of Pepha-Tight® was evaluated in vivo with 20 volunteers applying a test gel containing 5% Pepha-Tight®.